Nowadays, many companies advertised calorie reduced, less sugar and/or fat health food. These products costs much more than the usual biscuits, oats or cereals just because it is lower in fat and/or sugar content. During the initial period of this blog, I used to get easily sucked into these offers- I buy health bar when I was either cutting down on sugar or going on the GI based diet. As such, I would buy the most reasonable health chocolate bar that I could find for RM6.90 or something like that. Even though the calories content were not low, it boasts of Glyceamic Index of only about 50. So, I paid more for an energy bar because I believed that it would make me less hungry. But from travelling, being active, eating tones of carbs and losing weight, I realized that there is no need to resort to special products to lose weight. After all, a lot of product that claimed to have lower caloric content does not taste nice. And the fact that we have the mindset that it is low in calories would make us eat even more, thus probably making us gain more weight instead of losing it. 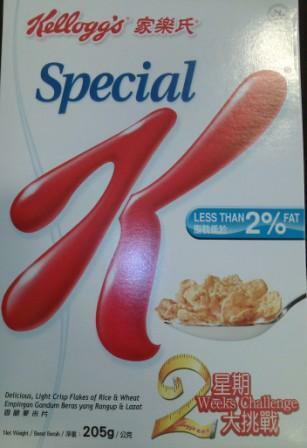 Kellogg’s Special- Less than 2% fat- It is light crisp flakes of rice and wheat. Cost up to about RM10 for a box 205 grams. Calories content: A bowl (45g) is about 165 kcal. So you see, any product that claimed to have low fat content would have relatively high sugar content and vice versa. In this case, 18% of the stuff in the bowl that you consume consists of sugar. 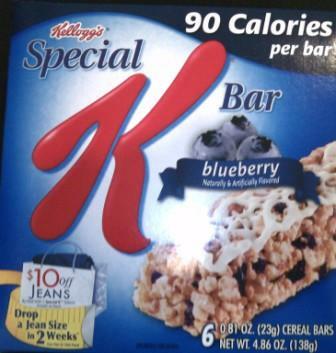 Next, Kellogg’s Special Bar- blueberry flavor– (up to about RM12 because of the special marketed value) with a clear label stating it is 90 calories per bar. Now, if you eat a bar that implies low calories, you would probably help yourself to a second bar. You end up paying more money hoping to consume less calories but end up eating more. Prevent an overeating binge later due to continuous self deprivation. 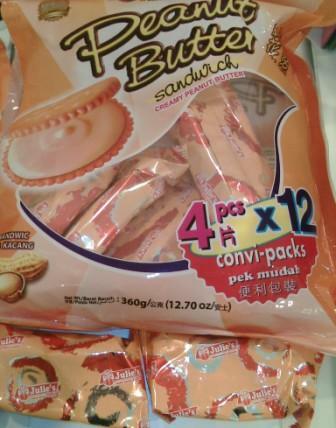 If you just want to snack, eating 2 of the biscuits would be enough. And because it is automatically ingrained in our brains that peanut butter is fattening, we tend to control the portion. Furthermore, peanut butter has a mid Glyceamix Index (GI) that means it tends to be more filling.